Hi there, my darlings!! Guess what?! Another fabulous review package landed up on my doorstep, courtesy of the lovely Sisi of Color4nails and I was so thrilled with the contents--3 polishes from what's becoming one of my fave Australian brands, Glam Polish. My experience with this brand so far has been interesting color combinations and fantastic formulas, so no wonder I got so excited for this next review! Today, I have for you 2 polishes, Freak Show and Fun House, from her Sideshow Alley Trio and Crysta, from her "A Touch of Magic" Trio! 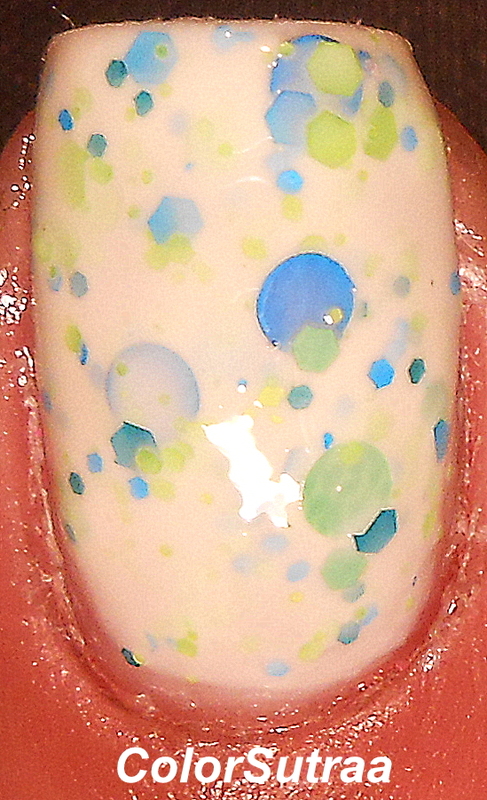 First up, I have for you Freak Show-- a white crelly with neon blue, neon green and medium green glitter including neon blue and medium green circles. I had absolutely no issues with application or formula and even the circles came out with nothing but a little swirling of the brush in the bottle. The swatches below show 3 coats by itself on the index and ring fingers and 2 coats over 2 coats of Sinful Colors Wisp on the middle finger, topped with 1 thin coat of G&G's HK Girl. I love the neon blue circles in this! Next up, I have for you Fun House--a white crelly filled with neon pink matte glitters and metallic purple glitters in a range of sizes plus a few added holographic baby pink circles. Again, no issues with the application or formula--the swatches below show 3 coats by itself on the index and ring fingers and 2 coats over 2 coats of Sinful Colors Wisp on the middle finger, topped with 1 thin coat of G&G's HK Girl. This is such a fun polish! 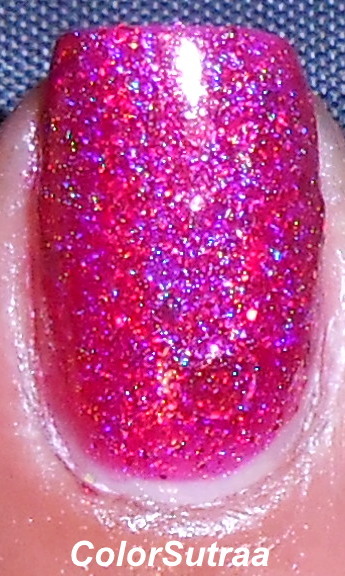 Last but not least, I have for you my favorite of the bunch, Crysta from the "A Touch of Magic" trio--an absolutely stunning magenta holographic polish packed with MORE holographic glitter! The swatches below show 3 coats by itself. While the formula on this polish was pretty smooth, it was a bit of a challenge to get the holo circles out of the bottle--my advice is to give the bottle a good roll between the palms and place the bottle upside-down for a while before painting your nails--I promise the results are SO worth the effort! This is such a gorgeous, super-sparkly beauty! So there you have it, my darlings! Three super pretty polishes from Glam Polish which are all currently available HERE at Color4nails' website for the price of $12.00 for a full-size, 12 mL bottle. While you're there, you can pick up a bottle or two of G&G's HK Girl too!